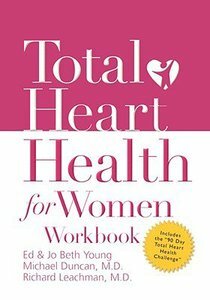 The "Total Heart Health for Women Workbook teaches women the unique connection between the physical heart and the spiritual heart by identifying medical facts vital to the health of a woman's physical heart, and biblical truths vital to the health of a woman's spiritual heart. It presents practical steps for applying the truths of Scripture to their walk with Christ and it encourages readers as they change unhealthy behavior patterns and replace them with a healthy behavior. The "Total Heart Health for Women Workbook presents the reader with a 90-Day Challenge, designed to help them embark on a lifestyle transformation. The reader will be encouraged to sift out old, bad habits and replace them with new, healthy habits. It will also challenge them to work out and fine-tune the good habits they have established. It takes 21 days to break an existing behavior, 40 days to establish new behavior, and 90 days to transform the new behavior into a lifestyle. This workbook will guide, challenge, and motivate through it all. About "Total Heart Health For Women Workbook"
Ed Young is the senior pastor of Fellowship Church, with four campuses in the Dallas/Fort Worth area and one in Miami, Florida. Ed Young Ministries is aired on television networks worldwide including USA, TBN, Daystar and CNBC Europe. Ed is a frequent conference speaker, particularly through Creative Church Conferences (C3). Find more on EdYoung.com. William L. Self is currently serving his twentieth year as the senior pastor of Johns Creek Baptist Church in Alpharetta, Georgia. Dr. Self is a graduate of Stetson University (BA), Southeastern Baptist Theological Seminary (BD), and Candler School of Theology (ThD). He has received numerous honorary degrees over the years. The McAfee School of Theology at Mercer University has established the William L. Self Preaching Lectureship in his honor. Michael works in the financial industry and he is a frequent guest speaker on merger & acquisition industry trends, and a regular lecturer of continuing legal education courses to corporate law firms. He has written articles on shareowner services and on stock options in The Journal of Employee Ownership Law and Finance. Graduating Villanova University in 1988, he lives in the NYC area with his family. He serves as an officer in The Knights of Columbus and member of the local Tea Party. Dr. Richard Leachman earned his Doctor of Medicine degree with honors from the University of Texas Health Science Center in Dallas, Texas, and is board certified in Internal Medicine and Cardiology. He is a fellow of the American College of Cardiology.